How many peak experiences have you had today? Let me rephrase this question: how many instances have you had today where you were fully immersed in what you were doing to the point that nothing else mattered? If you do not know the answer, you are not alone. Most of us go about our day without consciously attempting to experience moments that require our undivided attention. I am certain that you have had peak experiences as you skied down a slope, competed in a race, played the violin in a recital, gave your best presentation, read the most absorbing book or had a fascinating conversation. Mihaly Csikszentmihalyi, aside from having a difficult name to pronounce, is regarded as the leading researcher on positive psychology. His most notable contribution is that of flow. Csikszentmihalyi defines flow as the exceptional moments when we are completely immersed in what we are doing. In these moments, our concerns, worries, and physical needs disappear. In his research, Csikszentmihalyi determined that universally about 20 percent of us experience flow multiple times a day while 15 percent claim they never have this kind of experience. One of his specific studies surveyed 6,469 people in Germany and concluded that 23 percent of people experience flow often, 40 percent experience it sometimes, 25 percent rarely experience flow moments, and 12 percent never do or do not know. Another interesting research finding is that people who read books on a regular basis achieve flow twice as much as people that read occasionally or not at all. Why does flow matter? Csikszentmihalyi found a high correlation between the frequency of peak experiences, or flow, and overall happiness, the ability to deal with complexity, and ultimately higher awareness. We normally associate happiness with an emotional state that tends to be highly dependent on our environment and may include our family, friends, work, location, or finances. Any major change in our environment would normally result in the end of happiness or at least in its dampening. 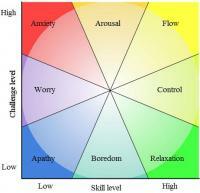 Csikszentmihalyi states that flow is a more predictable way of achieving and maintaining happiness. It does not depend on our environment, but on how we interact with it. Work, it turns out, is where we have access to a wealth of opportunities to experience flow. A key component of flow is active engagement. In fact, Csikszentmihalyi determined that peak experiences are seldom present when we are relaxed, watching television, or engaged in some form of entertainment. Now, relaxation and fun are necessary for the mind and body to recharge, but they are not where we will achieve flow. Flow requires an outcome and an activity in which we participate and where the value or quality of the outcome depends on how we engage. Let’s take a cashier at a grocery store. With all of the automation in place, there is little possibility for the cashier to experience flow with just the transactions. However, the cashier could perform the checkout process on auto-pilot and focus on interacting with customers. Each shopper would represent a mini-interaction full of potential peak experiences. Csikszentmihalyi determined that flow is most probable when both the level of the challenge and the level of our skills are high. A mismatch in these levels or low levels of both would produce a different kind of experience. For instance, a challenging situation where we have little to no skills to address any problems that arise would produce anxiety. A low-challenge situation requiring skills that we have already mastered would produce boredom. The point is that we should seek challenging situations where we have to constantly develop our skills. This may not be possible in every work or personal situation, but we ultimately have a choice on where we spend our time and what activities we engage in. A less than challenging work situation could be compensated with a challenging hobby. So how do we get into a flow mindset? For one, we should become our own researchers. Just like Csikszentmihalyi, we can tabulate our daily peak experiences and over a period of time determine how often we are having them. If our goal is to be among the 20 percent of the people experiencing flow multiple times a day, then we need to determine what is contributing to the lack of it in our lives. The two dimensions to consider are the level of challenge and our own skills. If you have an easy job or are overworked without the opportunity for flow, you may want to seriously consider changing what you do. Our personal lives are no different but may require different strategies. A key question to consider in seeking daily flow is what skills do we need to have more meaningful relationships, better conversations, and joyful interactions? Relationships, in general, provide many levels of challenge. Unfortunately, what we normally do with relationships, particularly the uncomfortable ones, is to do the absolute minimal to get by. In the Csikszentmihalyi scale, this type of relationship would produce worry or anxiety and not have any possibility for flow. The good news is that we can match the levels of challenge with our interaction and create flow-rich experiences that ultimately translate into a happier life. Csikszentmihalyi brings to light a simple yet powerful concept fully backed by research. Flow is not only something we may desire, but it is a necessary part of our evolution toward higher levels of complexity and awareness.